When high school senior Jenny Bonilla got her college acceptance letter in March, she felt shock and heartbreak rather than joy. That’s because the letter from Goucher College, a private liberal arts school in Baltimore, also brought news that she would owe an unaffordable $20,000 a year in tuition and board, even with a scholarship the college was offering. Bonilla had been in the running for a full ride to Goucher but eventually lost out because her parents’ combined income of $57,000 a year was deemed too high. “That was heartbreaking,” she said. 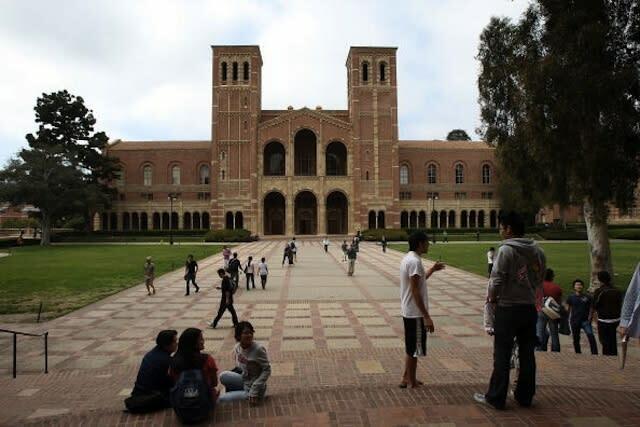 Bonilla’s experience is all too familiar to many students and their parents contemplating college, as higher education price increases have far outpaced the growth in middle-class wages over the past three decades. The average tuition and fees at a public, four-year university rose to $8,655 in 2012-13, not counting the costs of room and board, according to the College Board. That’s 250 percent more than it would have cost in 1982, when a year of college would have set the average student back just $2,423 in today’s dollars. The tuition at private colleges has increased at a slightly lower rate over the same period: The average four-year private institution costs $29,056, not counting room and board. It would have cost $10,901 in 2012 dollars in 1982. The pricey degree comes with big returns, on average: College-educated workers earned 79 percent more than high-school-educated workers in 2012 and were much less likely to be unemployed. The pain of the price hikes has been partly offset by an increase in federal grants and tax breaks for college, as well as by private schools offering deeply discounted tuition rates to lower-income students. But even with that help, some students like Bonilla are finding themselves locked out of the system. Why is college so much more expensive now than it was 30 years ago? Economists fall into two main schools of thought in explaining the trend. One theory, referred to as the “Bowen Rule,” says the decisions made by many colleges and universities—such as how many administrators to hire and how to spend its cash—primarily drive the cost. A competing theory, called “Baumol’s cost disease,” posits that higher education is expensive because of outside macroeconomic factors that affect other businesses, specifically that it costs more to hire highly educated workers even in fields that have not grown more productive. In other words, it’s either the colleges’ fault, or it isn’t. In their book, “Why Does College Cost So Much?” Robert Archibald and David Feldman, economists at the College of William & Mary, are firmly in the Baumol camp. They argue that a college’s hefty price tag isn’t actually surprising at all, given that it depends on the performance of its workforce—highly educated professors and teachers who provide a face-to-face service, not a material good. Larger economic trends have jacked up the salaries of highly educated workers across the board in recent decades, while the cost of face-to-face services has also remained high, because technological advances do not necessarily make these services cheaper. Feldman used the example of the cost of a haircut, which has also outpaced inflation in the past 30 years. While technology has made factories vastly more efficient at producing goods for less money, technological advances have not been able to make the time a haircut takes shorter or replace the skilled person who has to give the haircut. College is like a haircut on steroids, because the barbers have PhDs. “Higher education is an industry where there’s not a whole lot of productivity growth and not a whole lot of scope for productivity growth,” Feldman said. The vast majority of most colleges’ budgets go to personnel, and that cost is unlikely to come down any time soon. Benjamin Ginsberg, a political science professor at Johns Hopkins University, takes the Bowen view. In his book, “The Fall of the Faculty: The Rise of the All-Administrative University and Why It Matters,” Ginsberg argues that a significant increase in administrative employees is in part responsible for college’s runaway pricing. He writes that between 1975 and 2005, the faculty to student ratio has remained fairly constant at universities, while the student to professional staffer (such as an admissions officer) ratio increased from 1-to-50 to 1-to-24. Feldman discounts this argument. He points out that students demand a broader bundle of services from college now than they did 50 years ago and that the price reflects that. Students want staffers to plan student life activities, career counselors, fancy dorms, nice gyms and up-to-date technology. The economy as a whole, not just higher education, has also shifted to include more administrative positions in the past decades, he argues. Some argue that colleges have had no choice but to hire more administrative staff, in part because they are so thoroughly regulated by both state and federal governments. Colleges are required to report to the government all gifts accepted from foreign governments, supply information about the salaries of coaches and prove they commemorated Constitution Day every September 17, among other rules. Complying with the regulations requires staff. “Externally imposed regulations increase the cost of doing business, and that cost is passed on to consumers,” Terry Hartle, one of the chief lobbyists for the higher education industry, said. Hartle is senior vice president for the American Council on Education. State budget woes have also hiked the cost of many colleges. Sandy Baum, an economist and independent policy analyst for the College Board, says the price increases at public institutions have been driven by declining support from states, which have cut higher education in order to balance their budgets. “It’s not actually that the colleges are spending more money on the students, it’s that they’re getting … much less money per student from the state government,” Baum said. That means students aren’t necessarily getting more for their money, especially at public institutions. Advances in technology might help colleges cut costs in the future, either by allowing them to have fewer in-person classes as more people take classes online or by streamlining some library costs, among other possibilities. But higher education experts say there’s no silver bullet. “Colleges are looking at how to save money, and they need to look harder because it’s just so expensive,” said Baum. She mentioned increasing technology, streamlining government regulations and cutting back on administrators as some possible things to help costs. “There’s no miracles there,” she said. Jenny Bonilla didn’t have time to wait for a miracle. Bonilla’s father lost his job just days after she received her letter from Goucher, reducing the family’s annual income to $40,000. Bonilla’s parents didn’t want her to take on $60,000 in debt and knew they couldn’t come up with the money to help her on their own. They decided she should enroll in nearby Prince George's Community College for two years and then try to transfer to a four-year public school from there. “I applied to so many schools, and then for me to end up at community college is kind of devastating,” Bonilla says.